A very large cat has been rescued from a tree near a property in California after the homeowner saw it while working in the garden, officials say. 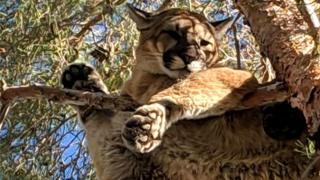 US firefighters arrived at the property in San Bernardino after the mountain lion - or cougar - was spotted perched on a branch about 50ft (15m) high. The area was then secured and the animal was tranquilised and lowered to the ground using a harness. It was released back into the wild following an assessment by biologists. "It is common for young mountain lions to wander outside what some would consider normal habitat in an attempt to establish their territory," said Kevin Brennan, a biologist with the California Department of Fish and Wildlife. The department's warden, Rick Fischer, said that extracting the animal would have been difficult had the firefighters not turned up within several minutes on Saturday afternoon with a ladder. "Leaving the lion in the tree would not have been safe for the community," Mr Fischer added in a statement posted on the San Bernardino County Fire Facebook account. Cougars, also known as mountain lions, panthers or pumas, are members of the wild cat family. They live across the Americas, from British Columbia to Argentina. Mountain lion attacks on humans are extremely rare. In North America, for example, fewer than a dozen fatalities have been recorded in more than 100 years, according to figures provided by Colorado Parks and Wildlife (CPW). Earlier this month, a man running on a popular park trail in the mountains of northern Colorado killed a mountain lion after it pounced on him from behind.